Black Friday, that annual post-holiday shopping ritual sharing more than a few characteristics with Spain’s Running of the Bulls, is starting earlier than ever this year, with many stores opening at 8 or 9pm on Thanksgiving Day. While many people participate in this frenzy of commercialism with the relish of a competitive athlete, others find the whole thing a bit baffling. Here are 5 infographics offering some interesting facts about this year’s festivities. Click each image to view full-sized. Nearly a quarter of American adults plan to start shopping before 3am on Black Friday, according to a survey by market research firm Lab42. Shoppers also plan to spend more money. In fact, $60 billion is expected to be spent this year, compared to $41 billion in 2008. 160 million people plan to shop on Black Friday, or about half the U.S. population – more than the number of people who voted in November’s election. Mobile technology is playing a larger role than ever in holiday shopping, particularly during ‘Cyber Monday’, the Monday following Black Friday. Why should you consider shopping at small local businesses rather than big box stores? This infographic lays out all of the ways in which small businesses benefit communities. 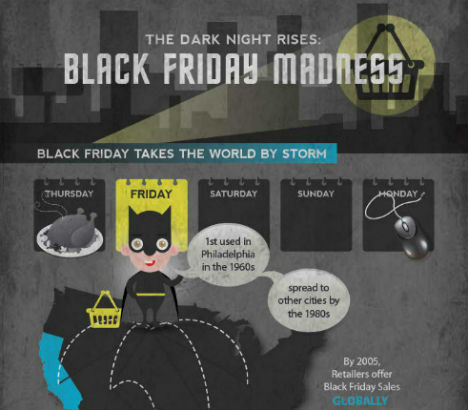 Another infographic from Manolith throws in a little bit of everything, telling shoppers how they can prepare, giving stats on Black Friday violence, and peeking into shoppers’ carts.